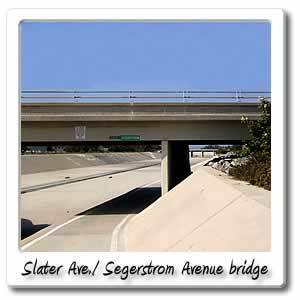 Welcome to Segerstrom / Slater on the Santa Ana River bicycle trail. You're now at the Segerstrom exit, there's not much here as half a mile south is the McArthur exit. 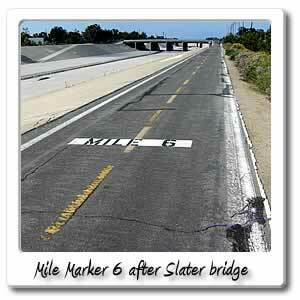 Half a mile north is Warner, which also has alot to offer. This might be the most boring exit on the trail. 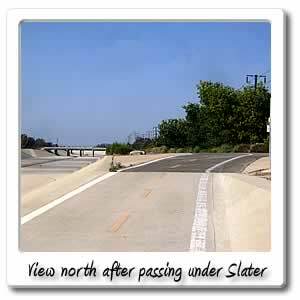 Heading west off of the bridge will take you into Fountain Valley, this is when the street name changes to Slater, less than 1/2 mile away you'll be at Euclid Street. Heading east a little more than 1/4 will take you into Santa Ana and Harbor Blvd.